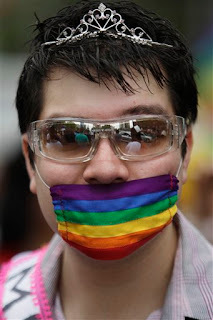 But he could have explained himself so much better...For readers out of the loop, Toronto city councilor John Campbell introduced a motion to strip Pride Toronto of their city grant for a decision to restrict the dress and conduct of police officers in attendance of the festival. Censorship is a tool of oppression. It cannot be used to create anti-oppression. I am a realist. Pride Toronto is a private entity. As much as they'd like to claim they represent Toronto's immeasurable diversity, they don't. Private entities have the right to organize themselves as they see fit. However, private organizations who take public funds are bound to the conditions of public opinion. Let's get some facts straight about Toronto Pride. Fact: Many community groups, businesses, and non-profits run events that contribute to the overall economic impact of the Pride Festival. Giving all of the credit to Pride Toronto is a beat up strategy non-profits use to lure funders. Fact: Taking away $260 000 hurts not a single queer person. It forces a very problematic organization to examine their conduct and realign their policies and expenditures within a financial reality that does not sponsor their censorship of parade participants based on occupation. Fact: Pride Toronto is a white, gay, capitalist institution. There's no rational disagreement with these descriptors. Pride Toronto is not entitled to public money. Fact: Legally, a university couldn't censor event participants like Pride Toronto plans to. Fact: We can give the money to more deserving applicants. Propping up Pride Toronto and saying "well, if you have a problem, get involved" is asking the oppressed to save themselves. Why should more people need to get involved when funding can just be given to less problematic recipients? The non-profit industrial complex is an axis of evil until it's something you like, right?